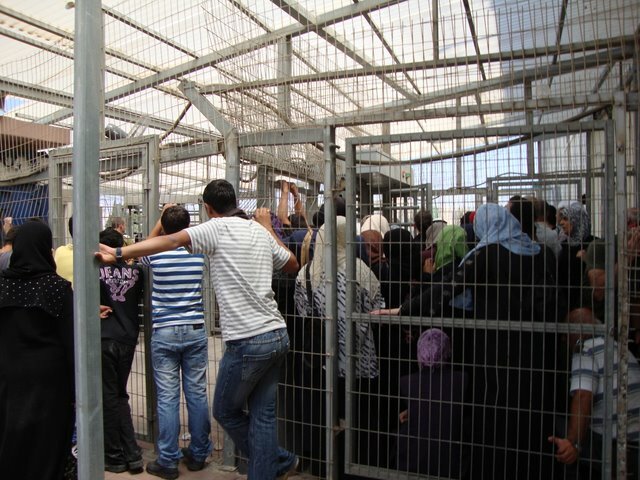 Because of alleged “security reasons” Israel is controlling the movement of Palestinians with an extended system of checkpoints, not only at the Israeli border but also inside the West Bank itself. In addition „Flying checkpoints“ can be put up by basically every Israeli soldier in the West Bank. About 43.000 Palestinians from the West Bank work in Israel (or in Israeli settlements) and have to commute through checkpoints on a daily base. And during Ramadan (this year from Aug. 11th to Sept. 8th) much more Palestinians try to cross the Israeli border to pray in the Al-Aqsa Mosque or in the Dome of the Rock in Jerusalem. During this time on Fridays, the islamic holiday, the checkpoints are overcrowded with people trying to be in Jerusalem for the noon prayer. On the third Friday in Ramadan the EAPPI Team at checkpoint 300 in Bethlehem counted about 17.000 people and estimated a number of 19.000 people (a little more than half of them women and between five and ten percent children) crossing the checkpoint between four and eleven o’clock in the morning. 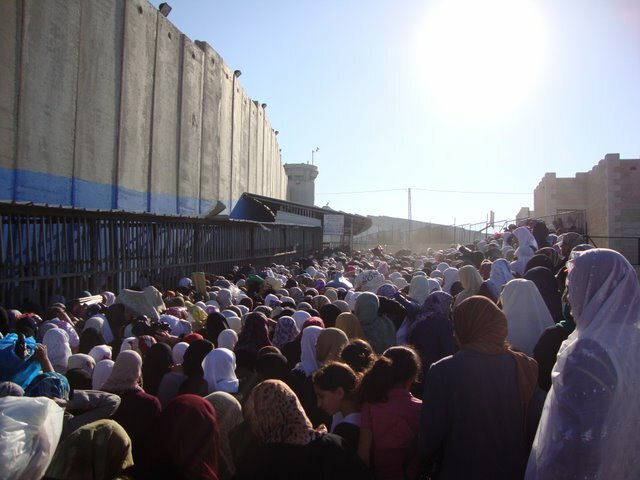 At Qalandia checkpoint, between Ramallah and Jerusalem, the estimated number on the same day was nearly 40.000. This high traffic of people means a enormous organizational task and stressfull and tense situations for everyone who is involved, the security personal, as well as medics and other staff and especially the people who are trying to cross. During the Ramadan in the summer moths also the heat becomes a special issue, since people fast from eating and drinking during the day and at the same time have to wait sometimes for hours at the checkpoints. “Why can I not pass?“ Nael (49) asked me. „I whis I could ask them why.“ Even so he was able to cross the checkpoint in the previous weeks without any problems, he was denied access on this Friday. Even so he tried to cross at different turnstiles, finally he had to go back home without success. Palestinians trying to enter Israel rely on permits which are given out for different purposes and different periods of time, for example for working or for a hospital visit. 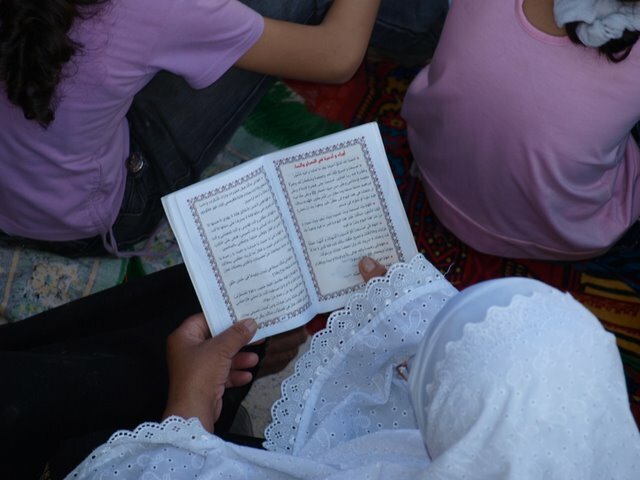 During Ramadan Israel gives out special prayer permits for men between 45 and 50 years and women between 35 and 45 years. Below this age range no adults are allowed to go at all, above no permit is needed. So in Naels case the officers on duty only decided after the formal regulations, which is still of course frustrating for him. And a lot of frustration also arises because soldiers regurly deny entry to people because of security reasons, for example when the database of someone shows suspicious records. Sometimes people do not even know why they were turned back. Usually the Israeli authorities try to avoid confrontations during Ramadan and try to ensure a smooth procedure. 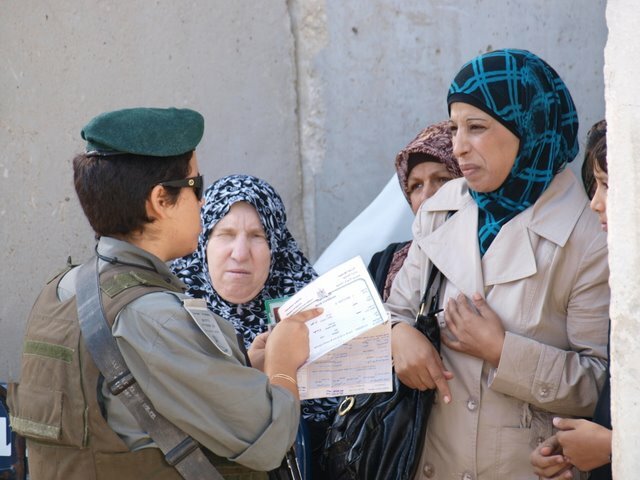 Experienced soldiers are assigned to the checkpoints and it exists a well organized working relationship with humanitarian organisations like the Red Crescent. During the high traffic hours usually a lot of journalists will be around and report about the situation. Its slightly different when you come after, about 12 or 1p.m. when the international audience left the scene. When I came back to the checkpoint about 1 o’clock I still found about 75 persons waiting in front of the first turnstile. The checkpoint was only manned with two soldiers who did not let past anyone. People started to discuss with the soldiers, some of them were producing their permits and children around me were knocking on the window of the small booth the soldiers were sitting in. There was now reaction on there side besides shrucking or an occasional shout to be quiet. When I asked the soldiers why they did close the checkpoint they answered that it was because of the shift change and that they had to wait for support. I finally called the humanitarian hotline of the military to complain. By now the people were waiting for already 30min. Just a couple of minutes later a man tried to sneak through the turnstile and got pushed back by one of the soldiers. Another one told the soldier in English that he had to go to the hospital and showed him his permit but was still denied entry. After 45min finally two high rank officers arrived at the scene. They opened the gate but instead of trying to secure a peacefull procedure after the situation was already quiet tense they were shouting at the waiting people and were pulling people through the turnstiles and pushing them back into the exit lane. Of the 75 people only about five persons were allowed to cross, the rest was send back. On my question one of the officers explained, now in a more friendly way, that they did not had the right permit to enter. One reason for the rude behavior might have been that the soldiers wanted to show who is in control after they received the call from the humanitarian hotline. Leaving alone the official legal situation, the closure of the checkpoint for 45min and the rude behaviour of the officers does not speak for the humanitarianism of the Israeli checkpoint policy. So far I experienced with about the same amount officers who tried to act in a very human and respectfull way and others who resembled more the above mentioned examples, whose behaviour certainly did not contribute to a peacefull relationship with the Palestinian people. A questionmark arises regarding possible solutions to the situation, since there are legitimate Israeli security concerns. Even so the separation of Israelis and Palestinians also leeds to a further isolation of the two people from each other. And it seems actually everyone is trapped in the complex of separation and movement restrictions, fear and hatred, violence and occupation. Maybe the only possible solution is just to go on and to make the best of it. That would include trying to secure Israels safety, but also a human behavior of the soldiers, a human policy of the Israeli authorities and a solution for the polical conflict, hoping that in the near future trust can be rebuilded between Israelis and Palestinians. And maybe our work can contribute at least to part of easing the situation at the checkpoints.